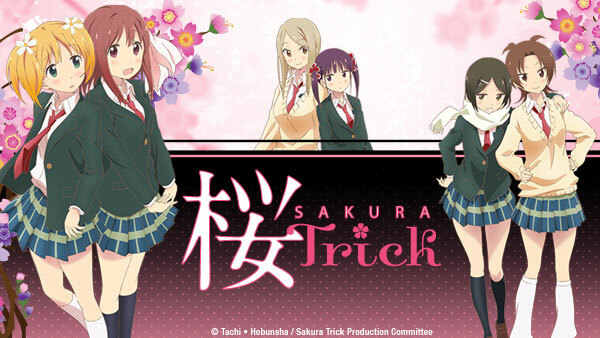 Sign up now to stream Sakura Trick, subs, tons of dubs, OVA's, simulcasts, plus the all new Dubcast℠ editions and more! Haruka and Yuu are the best of friends, but when they get to high school and that bond is tested, they become something more. Harua and Yuu stumble into a special moment between their two friends. Haruka vows to not let Yuu fail for the year in any way she can. Haruka petitions the student counsel to allow a cheerleading squad at the Ball Sports Tournament for Yuu. E4 | A Sour Mission?/Could This Be a Test of Courage? Yu's sister becomes suspicious of Haruka and Yu's relationship and enlists their friends to spy on them. Haruka and her friends try to ask Mitsuki for a favor but are thwarted when Yuu and the rest of the group show up. E6 | It's the Cultural Festival! It's a Sleepover!/ It's the Culture Festival! It's Showtime! The girls decide to spend the night at school to finish up their Culture Festival projects. Later, Haruka gets angry at Yuu for standing her up. The girls spend some time having fun in an indoor swimming pool. Later, Yuu and Haruka go shopping for the perfect scarf for Yuu. Haruka invites Yuu to a relative's wedding, but the invitation is misconstrued as a proposal. The group takes a trip to a light art show. E9 | The Year-End Debut of SBJK/ Sequel: A Sour Mission?! Mitsuki grows jealous of the lengthy phone calls and the closeness that has flourished between Haruka and Yuu. Haruka challenges Kaede in gym class to a jump rope contest. The group falls behind the rest of the class, and they end up in last place. Haruka and Yuu are caught kissing and Mitsuki forbids them kissing. Despite all of the watchful eyes upon them, Haruka and Yuu still manage to kiss each other in secret. Yuu argues with Mitsuki about the efforts to keep her and Haruka from kissing. Mitsuki confesses her love to Haruka.